Pretty gorgeous! Our condo had a yoga mat and I was SO EXCITED when I saw that when we first arrived. For awhile I had had grand plans to do yoga on the beach at least a few times on our trip. Sadly, that never actually happened. I’m disappointed by that but we just got busy going to the beach. 🙂 Despite that, I DID get a lot of fitness in, it was just different kinds of fitness. First, we did a kayaking/snorkel tour for 2.5 hours. That is quite a workout in itself. The next day we were both extremely sore in the calves (from snorkeling) and sore in the shoulders from kayaking. 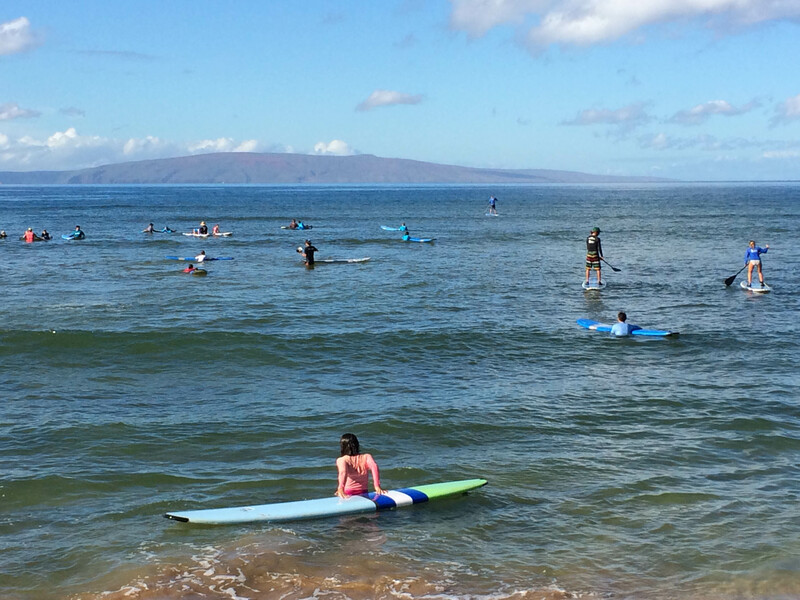 Second, almost every single day that we were in Maui we spent the morning at the beach. I would snorkel and swim for hours on end. 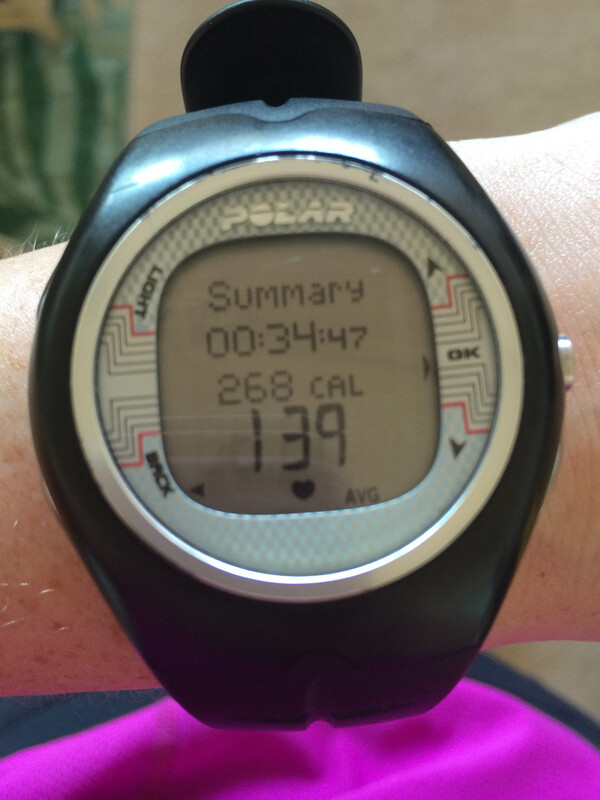 While I wasn’t tracking my calories or my exercise, that still counted for burning some calories! I did go for a run a few times. AND MICHAEL JOINED ME. Wow. I was so shocked. It was a honeymoon miracle!! And I have proof! A little treat. 🙂 I’ve never had shaved ice before and it seemed kind of silly, but damn it was good! 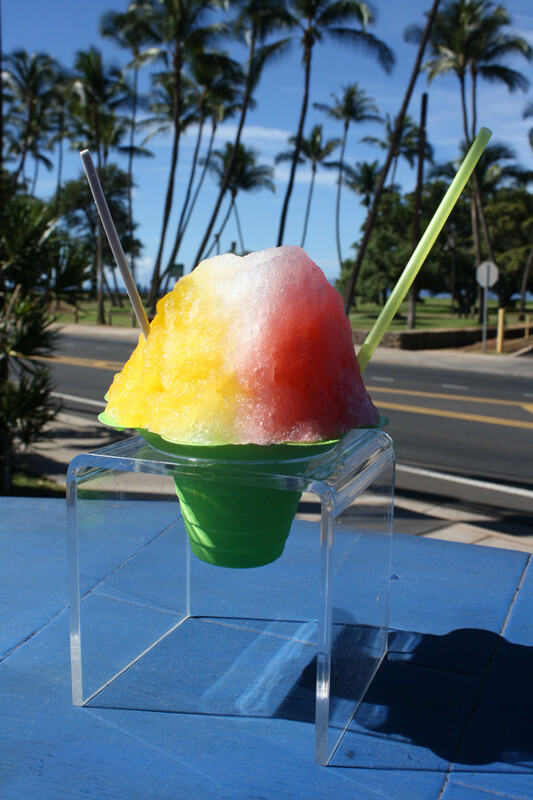 We relaxed and watched the people and the ocean and enjoyed our shaved ice on a hot day after a hot run. After that we went to the beach for some swimming. 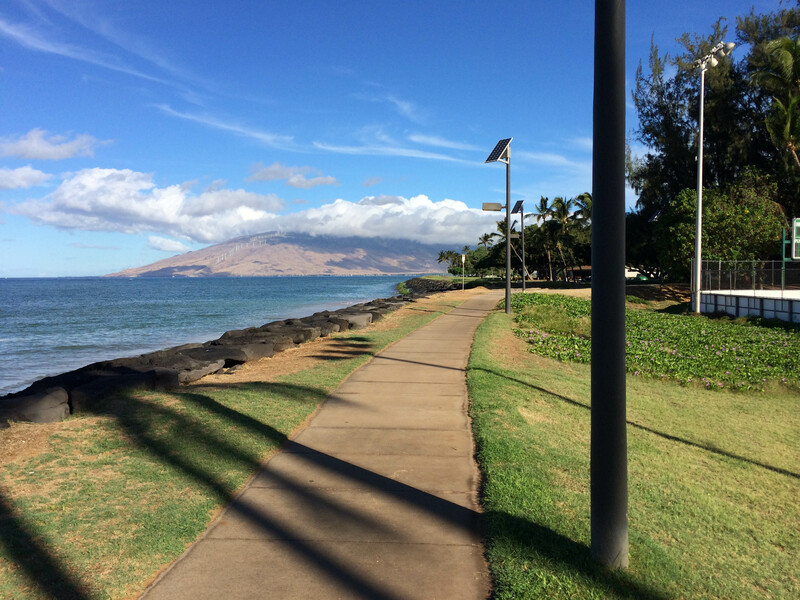 Another morning we went for a run and ran the opposite direction (north) in Kihei along the water. 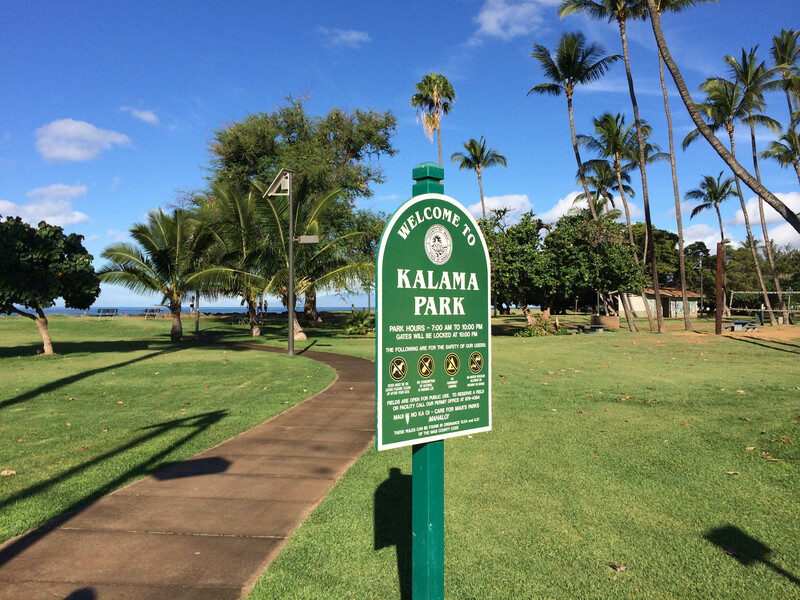 We ran all the way up to Kalama Park, which was really cute and huge. There was tons of stuff for kids there and a bunch of covered picnic areas. 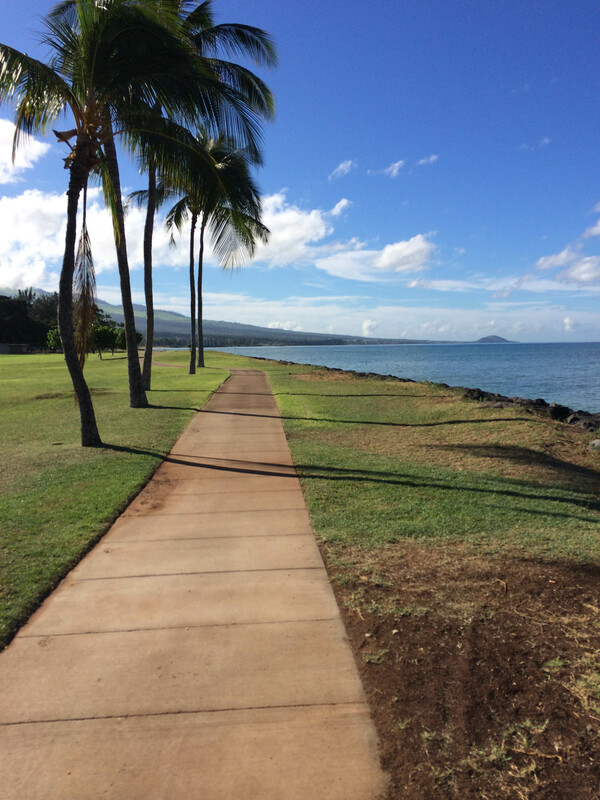 There was also this fantastic trail that ran along the ocean. It was picturesque and so perfect for running. This was something else we had planned on doing and never got a chance to. We’ve both wanted to try SUP and it was fun to watch everyone do it. Next time for sure! We headed back to the condo and ended up doing 2.53 miles total. 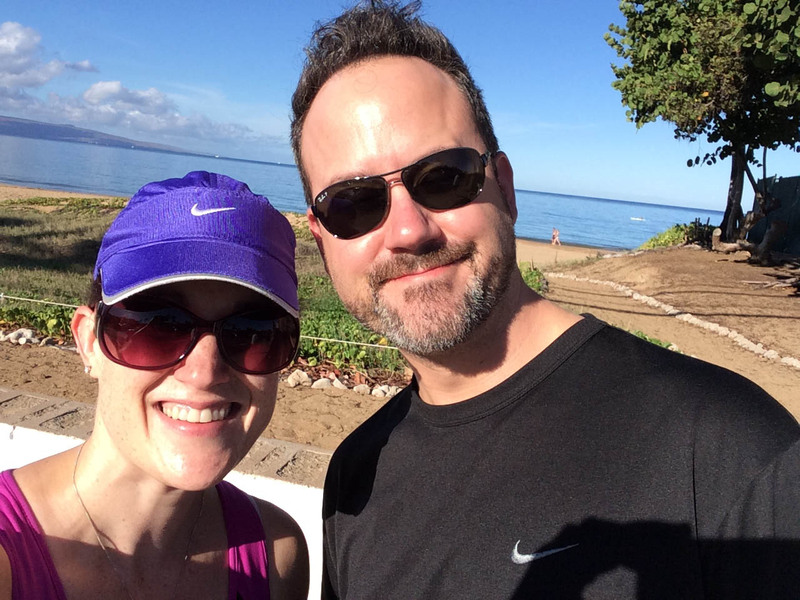 I had planned on running more in Maui and just didn’t. 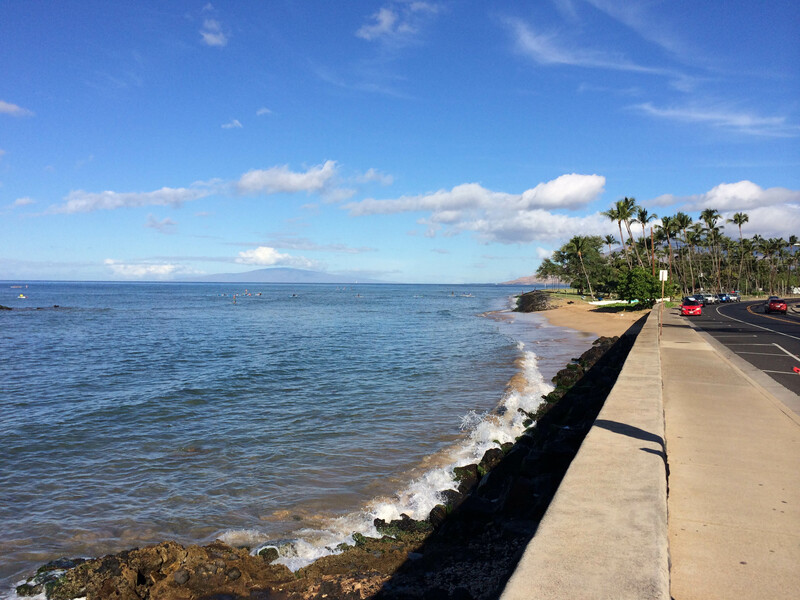 We got busy going to the beach every day and I chose to swim and snorkel instead of run. Also, by the end of the trip my knees were starting to hurt a bit and even got swollen one night. I think it was all the snorkeling and using the flippers. I rarely use fins when I swim and I think that was a little hard on my knees. The last two days at the beach I skipped the fins and just swam without them and felt a lot better. 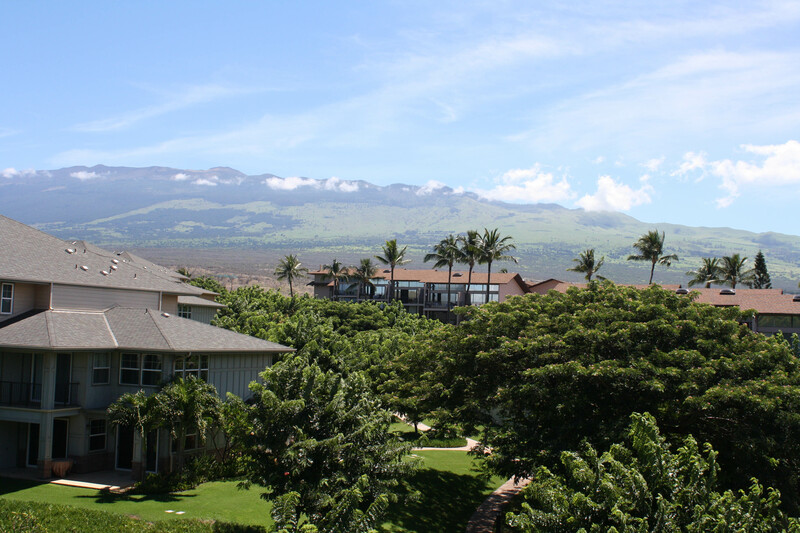 I feel like it was easier to stay active and WORK OUT in Kona a few years ago. I think part of that was that we were traveling with friends and they were often slow-moving in the morning. I’d get up and go for a run and then be back ready to shower and eat when everyone else was up. I think I also needed more “me” time on that trip and running was an easy way to do that. This time it was more about Michael and I spending time together (obviously). I’m reasonably happy that I stayed active during our honeymoon but also slightly disappointed that I didn’t make more of an effort. I had also planned on doing some body weight exercises along the beach in one of the parks with grassy areas. 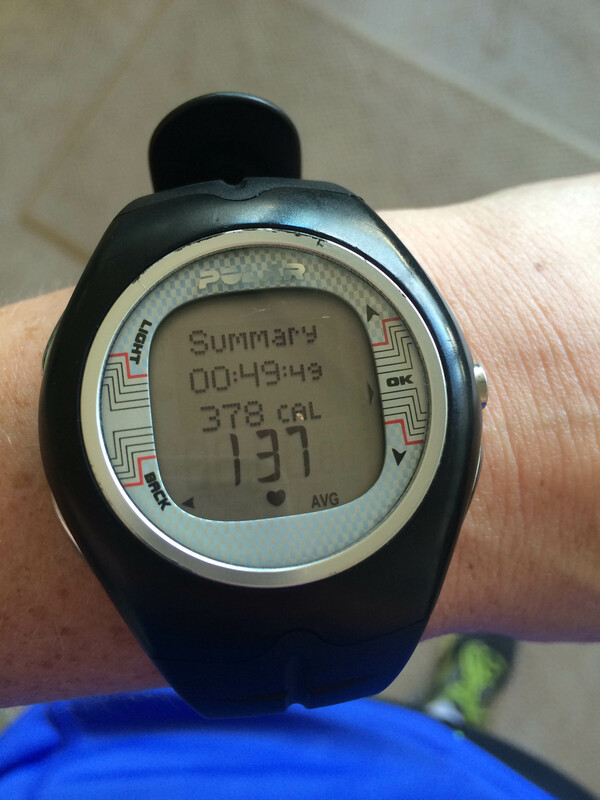 It would have been a great workout–squats, jumping jacks, push-ups, HIIT stuff. Can you imagine a better setting for working out? I can’t. Yes, it was nice quality time! Biz recently posted..I Need Your Votes! Lori recently posted..Dining Room reveal and CocoVia winners! It was absolutely beautiful. And now we’re back to Oregon rain….! Glad you are having a great time. Thanks for checking in Lisa!!!!! 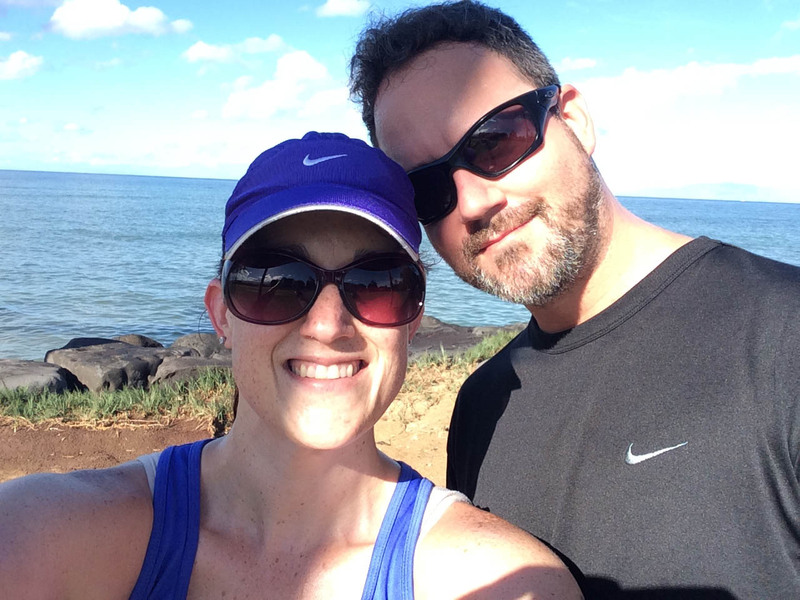 We had a great time in Maui. It was nice just relaxing. Snorkling is such hard work! It counts as a workout, for sure. It was definitely hard work. One of the days we snorkeled my calves were SO SORE the next day!